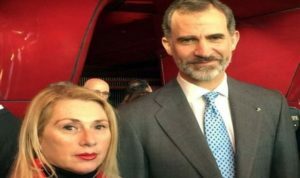 King Felipe VI of Spain received, Monday, the Chairperson of the Canary Islands Association of Victims of Terrorism (Acavite), Lucía Jiménez, who drew his attention to the situation of the families of the victims of the attacks committed by the Polisario in the Sahara during the colonial era and who have never been compensated. This meeting with the King took place on the sidelines of the awarding ceremony of the Adolfo Suárez Human Rights Award, granted by the Spanish Foundation for Victims of Terrorism. It came in the wake of the legal and administrative recognition of victims of terrorist crimes, by Court, by the Ministry of the Interior and by the Congress of Deputies. For the Chairwoman of Acavite, this recognition puts an end to “the neglect and abandonment of these victims by Spanish politicians and institutions, mainly in the Canary Islands”. According to the Canary Islands media, King Felipe VI told Jiménez of his keen interest to hear the ins and outs of the unresolved issues and understand the situation of the widows and orphans of the some 100 Spanish civilian and military victims of terrorist attacks committed by the Polisario militias between 1974 and 1977. Lucia Jiménez pointed out that her association has finally managed to draw the attention of public authorities to the issue of these victims, among whom was her own father who had been seriously injured in a Polisario assault against the Boucraa mining complex in 1976. She said these victims paid the price of the terrible attacks carried out by the Polisario Front against the Spanish military and civilians who worked at FosBucraa and against about thirty Canarian fishermen during the 70s and 80s in the maritime waters of Western Sahara, the former Spanish colony. In the past, the Chairwoman of Acavite had repeatedly denounced the fact that Spanish and Canary Islands institutions, associations and political parties support with millions of Euros the Polisario mercenaries, while the victims of this very Polisario “never received one Euro-subsidy or any kind of help from the Government, municipal councils or Parliament of the Canary Islands”. Jiménez had also repeatedly called on all Canarian political parties to distance themselves from “the reprehensible and irresponsible policy of double-talk, denial and ostracism when it comes to the victims of the Polisario Front’s terrorism in the Canary Islands”.